LONDON: Dele Alli scored twice in four second-half minutes as Tottenham Hotspur beat Chelsea 3-1 yesterday to end a 28-year wait for a Premier League win at Stamford Bridge. 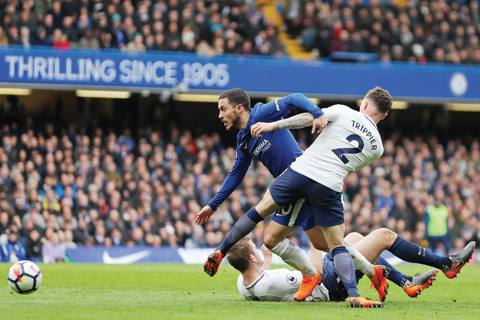 Defeat for the hosts all but ends Chelsea’s hopes of Champions League football next season as Spurs opened up an eight-point lead over their closest challengers for fourth place. Ending their long wait for a win at their London rivals is just the latest sign of the progress made under Mauricio Pochettino as Spurs look set to seal a place in the Champions League for a third straight season. And it was even more impressive as they came from behind as a huge error from captain Hugo Lloris gifted Alvaro Morata the opening goal. Christan Eriksen’s wonder strike levelled in first-half stoppage time, before Alli took centre stage to end a barren run by his standards with two smart finishes just after the hour mark. Spurs could even afford the luxury of doing the damage without Harry Kane, who made his return from a three-week layoff with ankle ligament damage 16 minutes from time. Alli was pushed into a more advanced role than his usual roving role behind Kane and had the first chance but couldn’t direct Eriksen’s cross goalwards. Chelsea were the side far more in desperate need of the points and that began to show as the first-half developed. Willian and Victor Moses forced Lloris into comfortable saves, whilst Marcos Alonso also saw a goal ruled out for offside. However, the French number one was clearly at fault when the opener arrived on the half hour mark. Morata hadn’t scored in the Premier League since Boxing Day, but no one has scored more headed goals in the league this season and he was left with the easiest of tasks to nod into an empty net as Lloris flapped at Moses’s cross. Lloris was also far from secure when he parried Alonso’s driven cross back into the danger area and relied on Jan Vertonghen to make a crucial clearance. Eriksen’s shooting ability from long range had been Spurs’ only real threat before the break. Willy Caballero, deputising for the injured Thibaut Courtois, got a strong hand to the Dane’s first warning shot. However, Caballero was helpless when Eriksen’s fierce dipping effort clipped the bar on its way past him in first-half stoppage time. The Argentine goalkeeper was forced into a brilliant save from another long-range effort, this time from Son Heung-min, on the hour mark as Spurs started to take control. And two minutes later they led when Alli brilliantly controlled Eric Dier’s long pass before slotting inside Caballero’s near post. Alli had scored just two goals in his previous 19 games in 2018 but soon had as many in four minutes as Spurs set the seal in a hugely symbolic win. Son was again denied by Caballero but Alli pounced on the pinball inside the Chelsea area before slotting into the bottom corner. Chelsea manager Antonio Conte kicked a water bottle into his dugout with the frustration of a man who knows his days in charge. Failure to make the top four is likely to seal the Italian’s fate no matter what comes of Chelsea’s run to the semi-finals of the FA Cup.